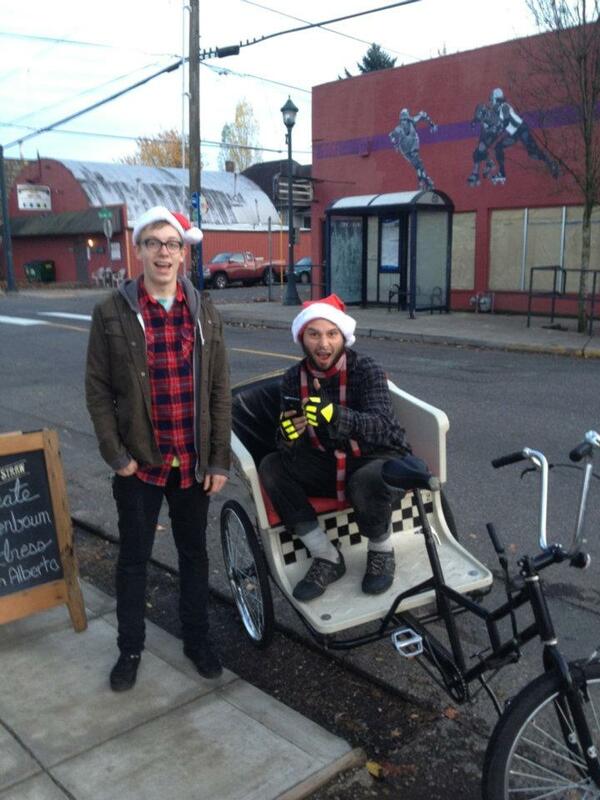 Portland Pedicabs | Portland Pedicabs provides the premier pedicab service in Portland! Portland Pedicabs provides the premier pedicab service in Portland! Portland Pedicabs Celebrates Bacardi Gras Fat Tuesday! Portland Pedicabs pedaled steady on Fat Tuesday, providing complimentary pedicab rides for Bacardi Gras! We pedaled revelers between Dirty, Splash, and the Barrel Room. It was a great night with many passengers. Our Portland Pedicab crew had shirts, lights, and most importantly Bacardi Gras beads to pass out to all the nightlife partiers. Portland Pedicabs had some great experiences on Fat Tuesday working with Bacardi. We pedaled the Lead Dancer at Dirty, many young couples, and some ladies who earned some more beads as we pedaled them to Splash! Dirty, Splash, and Barrel Room all had drink specials that our passengers were raving about. One crowd favorite was the Bacardi Oakheart, a new all natural spiced rum. Our Pedicabs were decorated with custom Bacardi Gras 2012 flags. We displayed them on the back of our pedicab carriages and wrapped around the seat. Tons of great compliments on the Mardi Gras masked faces! We pedaled folks all over downtown with our Portland Pedicabs for Fat Tuesday and Bacardi Gras. Thanks for the great night! Portland Pedicabs pedal U of O Ducks as the Grand Marshall of the Rose Parade! U of O Ducks Pedicab, a set on Flickr. Wow! Portland Pedicabs pedaled “Puddles” & the U of O Ducks in the Portland Rose Parade! It was one of our highest honors ever to pedal the 2011 Grand Marshall of the Rose parade, the U of O Ducks Football Program in our Portland Pedicab! The U of O Ducks had a great run for their football season, making it to the National Championship. The Royal Rosarians recognized this great talent and named U of O Ducks Football as the Grand Marshall for Portland’s most important parade. Portland Pedicabs was honored to be asked to pedal Puddles, the U of O football team, and cheerleaders in our Portland Pedicab! We custom decorated the pedicab to be U of O colors, with custom signage and flowers to celebrate the occasion! We even installed a Pedicab stereo system to play the U of O fight song throughout the Rose Parade! We had our veteran Eugene and Portland Pedicab rockstar, Phil Wood do the honors of pedaling Puddles in our pedalcab. Phil is the quackiest, duckiest pedicab driver ever to have graced the Portland Pedicab shop! It was such an honor to pedal Puddles and the U of O football program on their big day as the Grand Marshall! Portland Pedicab Sleigh Rides at Salt & Straw Gourmet Ice Cream! Salt & Straw Gourmet Ice Cream, Tumbleweed Boutique, and Grasshopper Store teamed up with Portland Pedicabs to provide a recent night of fun filled Portland Pedicab Sleigh rides, holiday flavored ice cream cones, and beautifully decorated shops! The event, just like Salt & Straw’s Fall Festival Pedicab Hay Rides was a smash hit. As couples and families poured in to the cute ice cream shop and lovely boutiques they were greeted by live music and even livelier employees. Portland Pedicabs was on hand to whisk folks from these great stores in our Holiday Pedicab Sleigh Rides! What better way to end the evening, than with a pleasant Portland Pedicab stroll down Alberta st to admire the shops and boutiques. Portland Pedicabs helps film Bike Racing at Alpenrose Velodrome. Portland Pedicabs make a perfect platform for photographers and videographers! Our Pedicab was hired by the great non-profit, Bikes and Ideas for Kids Empowerment. This local group is also known as B.I.K.E. They are dedicated to helping at risk youth find purpose and focus through bicycle racing. There were two jobs for our Portland Pedicab around the lower track of Alpenrose. The first mission was to provide family, friends, and supporters with rides around the track, while cheering their favorite racers! Our second purpose was to pedal the great Alpenrose photo and videographers around the inside track, giving them better shots and exposures of the youthful racers. Our cab was especially able get footage with less “whiplash” as the racers passed, because we could roll with them! Here are some of the photos of our great pedaler, Troy Hashagen, pedaling around Alpenrose, making smiles and helping record them, too! Best wishes to B.I.K.E. and all of their great kids! Portland Pedicabs is happy to help you promote your mission! Portland Pedicabs worked hard this weekend pedaling folks to Rum Club for Portland Cocktail Week. We partnered with Rum Club and Bacardi and provided shuttle Portland Pedicab service to Rum Club for all the Portland Cocktail dignitaries! Especially late in the evening, our Portland Pedicabs were busy! We pedaled many trips to and from Rum Club. All of the Portland Cocktail Week folks kept us pedaling laps! Rum Club was definitely the place to be during Portland Cocktail Week. We had such a wonderful time touring two locals around Portland, after their dinner at Pazzo Ristorante. It was beautiful evening. They enjoyed seeing how the Pearl had changed since years past. It was nice to travel through downtown, the Pearl District, the Portland Waterfront, and Chinatown via Portland Pedicab and at a leisurely pace. Thanks for enjoying our Portland Pedicab waterfront tour! It was a pleasure to give you two a new view on your hometown! Portland Pedicab Hay Rides encounter Goats on the Neighborhood Greenway! What a great afternoon! Portland Pedicabs had a wonderful time providing pedicab hay rides for Salt and Straw, NE Alberta street’s farm-fresh, handmade gourmet ice cream shop. Salt and Straw was hosting an amazing Fall Festival, with a live band and Portlandia Pedicab Hay Rides! The Fall Festival was held to celebrate harvest and the new seasonal flavors of Salt and Straw. They had a line out the door all afternoon! It was a beautiful October afternoon in Portland to enjoy some Lemon Basil Sorbet or Pear Blue Cheese. Kim Malek, the founder of Salt and Straw, had brought fresh hay from her backyard farm. We worked together to fashion some mini haybales for our pedicab seats. Everyone enjoyed their Salt and Straw ice cream as we pedaled them in our Pedicab Hay Rides. We pedaled around 30 pedicab trips around the neighborhood from the Salt and Straw Scoop shop at 2035 NE Alberta St. The favorite Pedicab Hay Ride was to pedal down Alberta and then tour back on NE Going, the nearby Neighborhood Greenway. Portland is a small town and we ran into many people we know. I was also excited to pedal a couple who we had pedaled their wedding earlier this summer! Pedicabbing in the neighborhoods of Portland is always different than being downtown. The best was when we pedicabed some folks along NE Going, Nd we came across people walking their goats. It was an “only in Portland” moment, until we realized we were all in a Pedicab eating Ice Cream in October! Thanks to Salt and Straw for such a wonderful Fall Festival! Portland Pedicabs loved pedaling all your guests and friends for Pedicab Hay Rides around the neighborhood.